It isn’t very often that university students get to eat literature, but at Virginia Polytechnic Institute and State University, known as Virginia Tech, in Blacksburg, Va., they did just that. 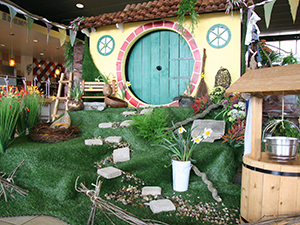 During a recent event entitled Springtime in the Shire, the dining services team brought J.R.R. Tolkien’s classic novel about Middle Earth, “The Hobbit,” to life—and to the mouths of university students. Beginning at 7 a.m., students sampled Lembas bread, also known as cinnamon raisin scones, and Egg in a Basket—eggs fried in toast. Elevensies featured fish and chips, a Fires of Mordor pizza and Dwarf’s Pie. Special tea varieties and finger sandwiches were served at Afternoon Tea. The evening meal featured some usual dinner menu items, renamed to align with the event theme, along with costumed staff, Hobbit Holes (homes built into a set), decorations and a live, three-piece Celtic band. Virginia Tech has hosted fiction-themed events before, but Springtime in the Shire was the first one that was spread throughout the day, rather than contained to one meal. The event was a year in the making. The dining services team first came up with the theme, then designed and built props and finally prepared the menu and dishes in house. The team also had the help of Party Positive, the campus’ student alcohol awareness group, which sponsored a “pub” of non-alcoholic drinks and awareness messaging for the event. The event was something that would have made Gandalf, one of the book’s wizard heroes, proud: According to Hess, dinner attendance figures came close to 1,400—nearly twice that of a typical day.